Practically Shameless: How Shadow Work Helped Me Find My Voice, My Path, and My Inner Gold. By Alyce Barry. With a Foreword by Shadow Work® Founder Cliff Barry, Founder of Shadow Work®. Longmont, CO: Practically Shameless Press, 2008. An uplifting and compassionate guide to transforming your life through Shadow Work®. Using a story from the author’s life, including a riveting first-person account of Shadow Work® processes, this life-affirming narrative demonstrates how to honor your life, understand and befriend your resistance, and effect the lasting change you desire. Offers the reader a direct experience of Shadow Work®. >>Also available from Amazon UK. Now in its third printing, Practically Shameless is an uplifting and compassionate guide to transforming your life through Shadow Work®. 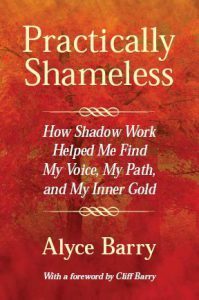 Author and Shadow Work® facilitator Alyce Barry uses a story from her own life, including a riveting first-person account of her Shadow Work® processes, to demonstrate how to honor your life, understand and befriend your resistance, and change in a lasting and deeply satisfying way. The book ends with an exercise that offers a direct experience of Shadow Work®. Practically Shameless is destined to have an impact on every reader longing for change. Recognize the truth that you have nothing to regret. Unearth the meaning of—and positive intensions behind—your resistance. Discover the treasure buried within your shadow. Transform your shame and self-blame into compassion and self-acceptance. Claim the vibrant self that is your birthright. Published by Practically Shameless Press, books for the general reader offering practical applications for archetypal psychology. Visit the Practically Shameless Press website for study guides, excerpts and testimonials, future titles, and more. Details: Paperback, 6″ x 9″, 216 pages, with a Foreword by Shadow Work® founder Cliff Barry. Contains 35 illustrations and photos, an Appendix detailing the Shadow Work® Model, and an index. Copyright © 2008 Alyce Barry. All rights reserved. Read Alyce’s articles about writing the book, previously published in our free email newsletter. As a girl, the author wants to belong in a circle of friends and to live a creative life, but a destructive behavior sabotages her efforts. The pattern persists into adulthood. By the age of forty-four, she is a woman without friends, encased in shame and depression. A call for help from her brother, Cliff, brings her to a Shadow Work® weekend workshop, where she learns that there are four kinds of shame. She begins to view her destructive behavior as a four-sided box. As she studies its four walls, she recognizes the box’s origin: it has been her unconscious way of bonding with her hyper-critical father, a WWII veteran suffering from trauma. A memory resurfaces of a painful incident. Wall by wall, Alyce works to transform the box, facing a risk at every turn. The greatest risk calls forth the part of her that has been sabotaging her efforts to change in order to protect the bond with her father. When this part of her is honored for its role, it becomes her ally. In a touching ceremony, Alyce lets go of her unhealthy way of loving her father and is finally able to change. When she leads a workshop of her own, Alyce encounters a man who does not believe he has an inner protector. When she honors his skepticism, his protector emerges to tell a moving story of survival. A series of images illustrates how this man learned to resist change and then how the technique of honoring his resistance transforms it into his ally. The reader is then invited to experience an honoring directly. That shame creates “the box” that we feel trapped in. That the box is not a mistake but a strategy, designed to protect us from something that would have been even worse than the box. That a part of us guards the box, keeps us from knowing that it exists, and resists our every effort to change. That “thinking outside the box” is merely flipping into an opposite strategy and changes nothing fundamental. That we inevitably flip back because the box’s reasons for existing have not changed. That the box has four distinct walls, which were at one time open portals to our Divine potential. That Shadow Work® transforms the walls back into portals and the box into a gift. An Appendix explains the Shadow Work® Model and describes the sixteen different kinds of boxes. A notes section adds explanation that would otherwise interrupt the main narrative. copyright © 2007-2017 Alyce Barry. All rights reserved.